Well, it is a fabulous experience to once again be a beginner. I am fortunate that since I am a Pipe Organist, playing on a pedal-board with my feet is not unusual. However, to play with my fists instead of my finger tips is a new experience. What is a surprise, however, is how many things I do which so drive me to distraction when my own students do them! After writing this blog for several years, in an effort to communicate simple truths about practice and preparation, I am humbled to realise that as a beginner, I am falling into such similar patterns as my students. AND I SHOULD KNOW BETTER! It is helpful to go through this experience on my journey, as it helps me to understand life from the stool, and hopefully will once again give me more patience when students exhibit any of these tendencies. Well, I did promise to report back on my experience as a beginner. I have now had two carillon lessons, and it has been fascinating to see how I fall into all the habits that drive me to distraction in my own students! I play much faster than necessary. I know that the chances of success are much higher if one starts slowly, but I want to show off for my teacher, and I want to sound good. I try pieces all hands and feet together, when I know that my chances of success are greatly improved if I learn things hands/feet separately first and then slowly add a component. I know that practising 15 minutes a day is preferable to doing 1 hour’s practice the day before the lesson, and yet this is what I do (although in my defence, I have to make a journey to the carillon, so it is more difficult that picking up an instrument at home). Already, this experience is giving me more insight into my students, and hopefully it will increase my patience when students exhibit any of the above tendencies! 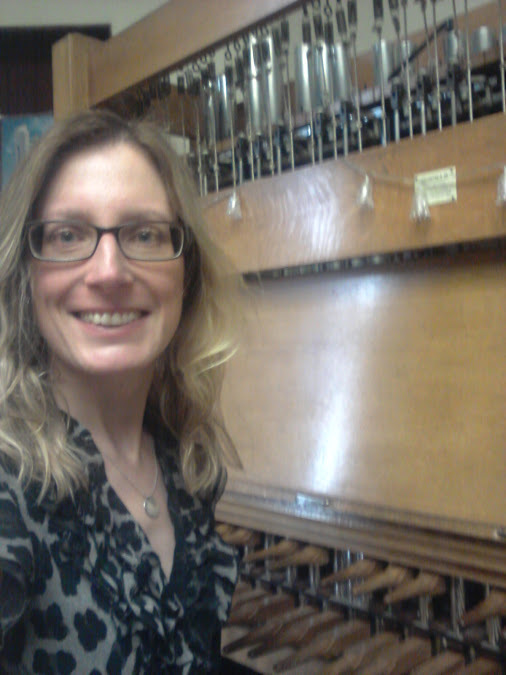 Me at the Sydney University practice Carillon…. am I the only one who thinks that it looks a little like a medieval instrument of torture? !